COLOR(S): Mixed colors of black, cream, gray, brown, red, and reddish brown. An English Boodle is a Poodle hybrid that is a cross-breed of a Poodle and a English Bulldog and may demonstrate any combination of traits from those two breeds. Poodle hybrids have become very popular in the past few years. They play a big role in the current designer dog trend. The cross with the Poodle is usually because of the Poodle's nonshedding coat. The experimentation of these hybrid or designer dogs has not been recognized by the American Kennel Club or Canadian Kennel Club. The key to cross breeding to purebred dogs is what is called hybrid vigor, the breeding resulting in a healthier dog with superior genetic constitution can come from dogs purebred for so long that they have common genetic disorders. Affectionate, loyal, and gentle, English Boodle puppies and dogs are family oriented. They do not do well if left alone for extended periods of time and will become destructive and bark incessantly if bored or lonely. They do well in homes with considerate children. English Boodle puppies and dogs do best with dogs and other household pets they have been raised with. The English Boodle is an adept watchdog who will alert their family to visitors or out of the ordinary sounds. Regular brushing is recommended for English Boodle puppies and dogs. Bathing should be done when necessary using a mild shampoo. English Boodle puppies and dogs may be prone to such health issues as skin infection, PRA, epilepsy, and heart disease. The exercise needs of English Boodle puppies and dogs will vary. They are well-suited for apartment living. 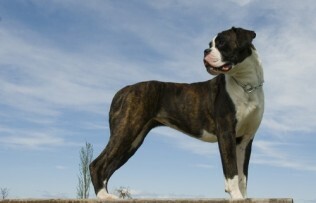 They enjoy family activities, securely leashed walks, and off-lead play time in a securely fenced yard. English Boodle puppies and dogs may be stubborn. However, they will not respond to harsh or heavy-handed methods. Training must be done with firmness, fairness, patience, and consistency.